This is one of those odd little convenience stores that are around the Upper Valley that we all drive by on a regular basis. 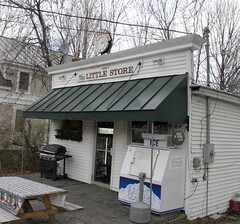 Indeed, when I first mentioned the Little Store to most people, I got back a “where?” in response. But inside, it has a lot packed into a little space. In addition to the typical convenience store amenities (drinks, chips, some wrapped sandwiches under warming lights, and the ubiquitous McKenzie hot dog warmer), it also has a full meat and deli counter (mostly McKenzie products). And, most importantly, every day they have hot lunch specials, hand-written on a piece of paper taped to the front of the deli case. And while the deli sandwiches are good, it’s these lunch specials that repeated bring me back. 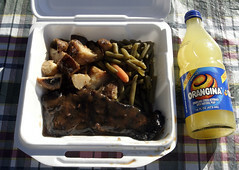 Yesterday, the top special was grilled sirloin with home fries and green beens (pictured at right), while Carol opted for the BBQ lunch. That’s right, steak with home fries and veggies for $6.99. Yeah, the steak is a little more cooked than I prefer, and if I ate here more frequently I’d have to make an appointment with the cardiologist, but the food is tasty, very filling, and quite the good deal for what you pay. Other specials are usually things like teriyaki chicken, American ghoulash, or some sort of pasta dish. It’s always random, but almost always good, and either sirloin or ribeye steak make a fairly regular appearance on the special menu. Another thing I enjoy about the Little Store is that the staff is very friendly and accomodating, since I can regularly talk them into substitutions on my lunch special (some mac and cheese on the side instead of potato, for example). All in all, this is one of my top hidden lunch gems of the Upper Valley. 1. This is one of the best lunch values I know of in the area. 2. Between the hamburgers, deli sandwiches, and specials, there’s always something you’ll like on the menu. 3. You won’t go hungry. 4. It’s usually not all that busy. While it gets a fair number of local tradesmen during the lunch rush, this is still off of the radar for many people. 1. While it’s one of the best lunches, it’s not exactly one of the healthiest. We would love you to stop by the newly renovated Nosh at The Little Store in Lebanon. A lot different than the old Little Store. You’re in my queue. I’ve been there twice (breakfast and lunch) and had some great food, but haven’t yet been with my camera. Soon, I promise! Thank you!! Can’t wait to meet you!